The NASCAR Hall of Fame voting committee met at the Hall of Fame in Uptown Charlotte, N.C., on Wednesday and selected Jeff Gordon, Davey Allison, Alan Kulwicki, Jack Roush and Roger Penske as 2019 inductees into the NASCAR Hall of Fame. They officially will be inducted into the Hall on Feb. 1, 2019. When officially inducted, Gordon will become a first-ballot hall of famer. He was added to the list of nominees for consideration for 2019 induction this year, his first year of eligibility after officially retiring from competition as a full-time NASCAR premier-series driver at the end of the 2016 season. He returned for a handful of races in the second half of the 2016 season as a substitute for the injured Dale Earnhardt Jr.
Gordon is a four-time NASCAR Cup Series champion, third on the all-time list behind seven-time champions Richard Petty, Dale Earnhardt and Jimmie Johnson. 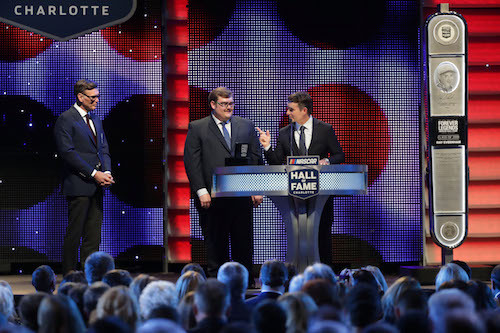 Petty and Earnhardt were part of the first induction class into the NASCAR Hall of Fame. As a still-active driver, Johnson still is not eligible for Hall consideration. Gordon also has 93 premier-series race wins, third on the series all-time wins list behind Petty and another NASCAR Hall of Famer, David Pearson. Gordon received the most votes Wednesday, appearing on 96 percent of the 57 ballots cast, including one containing the results of an online fan vote. Roush was second in voting, selected on 70 percent of the ballots. Penske and Roush weren’t in the top-five of the fan vote. Instead, Buddy Baker and Harry Gant joined Gordon, Allison and Kulwicki as the top-five in the fan polling. Penske and Roush were selected for their accomplishments as NASCAR team owners. Roush is the winningest team owner across NASCAR’s three national series — Monster Energy NASCAR Cup, Xfinity and Camping World Truck — with a combined 325 wins. Roush has five national-level owner championships, and his drivers have won three driver championships, including two at the Cup level — Matt Kenseth in 2003 and Kurt Busch in 2004. Penske, meanwhile, is one of the most successful car owners across several racing series, including NASCAR. He has over 100 race wins at the top level of NASCAR and Brad Keselowski won the 2012 Cup Series championship as a Team Penske driver. Penske also shares a NASCAR Xfinity Series record of three-consecutive owner championships in the series, earned between 2013 and 2015. Penske also is credited with the construction of Auto Club Speedway in Fontana, Calif., and is a former owner of Michigan International Speedway in Brooklyn, both tracks that host NASCAR’s national series. Allison’s Cup Series career was short before he lost his life in a helicopter crash at Talladega (Ala.) Speedway. In a premier-series career that spanned 1985 through 1993, Allison won approximately 10 percent of the races in which he competed with a tally of 19-career victories in 191 starts. He finished third in the championship points standings in his final two seasons of full-time competition in 1991 and 1992. His wins include the 1992 Daytona 500. Like Allison, Kulwicki’s career also was cut short by tragedy. After winning the 1992 Cup Series championship, Kulwicki died as a result of injuries sustained in a plane crash en route to Bristol (Ten.) Motor Speedway after a sponsorship appearance in 1993. Kulwicki went full-time Cup Series racing in 1986 and claimed five wins as an owner/driver and made five trips to victory lane in 207 race starts. His 1992 championship was the last for an owner/driver until Tony Stewarts final championship for Stewart-Haas Racing in 2011. The NASCAR Hall of Fame voting committee also selected Jim Hunter as the recipient of the 2019 Landmark Award for Outstanding Contributions to NASCAR. Hunter worked in NASCAR for more than 60 years in capacities including journalist, track public relations director and track president. He was PR Director at Darlington (S.C.) Raceway and Talladega Superspeedway and later served as President of Darlington. He also served as Corporate Vice President of International Speedway Corporation, parent company of Darlington and Talladega.